Sailing to Byzantium is a celebrated poem by William Butler Yeats, describing the spiritual, mystical and inner world and thoughts of the famous Irish poet in regard to the apocalyptic end of life and eternity. Written in 1926, it was published in 1928, late in his life. Here, I would like to especially thank Paul Kelly, an excellent musician and guest on our last Cruising to the Cyclades, for reminding us of this marvellous poem and sharing unforgettable moments during the cruise. 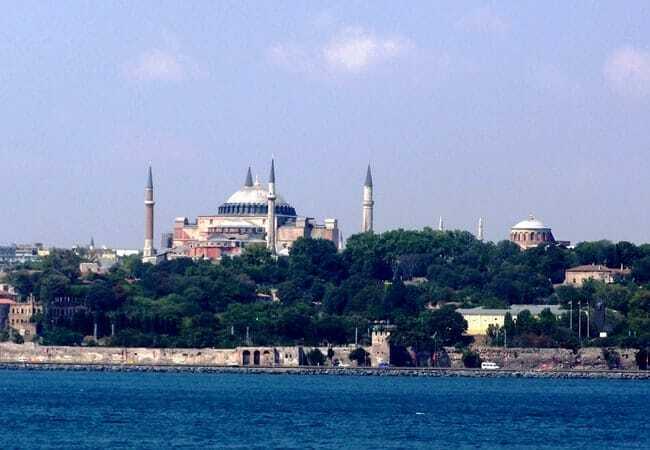 The Agia Sophia at Istanbul/Constantinople/Byzantium, as seen from the Bosphorus. Contemplating the words “the Holy city of Byzantium”, “the golden mosaics, the monuments of its own magnificence” and also the flourishing art of the Palaiologan Era, I decided to go adrift myself, to roam through the last centuries of the Empire, ranging across a relatively small territory. 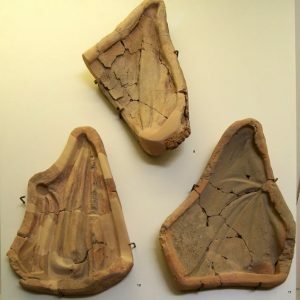 Parts of Asia Minor, Thrace, Macedonia and the Peloponnese were all that was left to the Byzantine Emperors’ formerly vast domain, as much land had been lost to Latin and Frankish rule. During over 1000 years of history, the Byzantine Empire experienced several crises and dramatic changes affected its complex and multicultural character more than once. The loss of the capital to the Crusaders in 1204 undoubtedly was one of these dramatic moments: even when Michael VIII Palaiologos (reigned 1259-1282) recaptured Constantinople and restored as the Byzantine capital fifty-seven years later, in 1261, political and financial troubles still tormented the state. 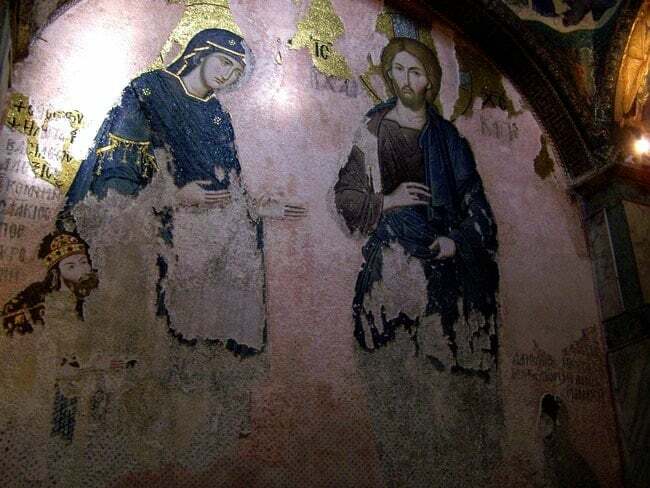 Nevertheless, artistic production of every kind flourished at this time, older religious foundations were restored and new ones were inaugurated during this period, both in the capital and in many recently recovered Byzantine provinces. Frescos in the apse of the church of St. Nicholas at Platsa in the Mani Peninsula of the Peloponnese. Dedicatory inscriptions and donor portraits, in addition to written sources, testify that members of the imperial and aristocratic classes sponsored a large number of artworks, aimed at legitimating and establishing their power, as well as underlining the ecumenicalcharacter of the Byzantine Empire. For example, on a church in Kastoria (Macedonia) the juxtaposition of a portrait of Michael VIII, founder of the Palaiologan dynasty, with that of the founder of the previous Komnenian dynasty evokes exactly the descent of the former from the latter and the legitimacy of his authority (more on that topic in my recent post about Kastoria). In addition, many lavishly illuminated codices, biblical manuscripts, icons, embroideries and precious portable objects were commissioned by the imperial retinue and also used as gifts in the service of state policy. Moreover, numerous religious establishments and decorated churches were built in the provinces by members of the high- and middle-ranking aristocracy, often part of the military context. That is the case for a great number of chapels built in Macedonia (Northern Greece) and the Peloponnese in the course of the 13th and 14th centuries. What you see above right is the splendid apse decoration of a small church, sponsored and renovated in 1337-38 by the military commander of the mountainous area of Taygetos in Laconia on the Peloponnese. 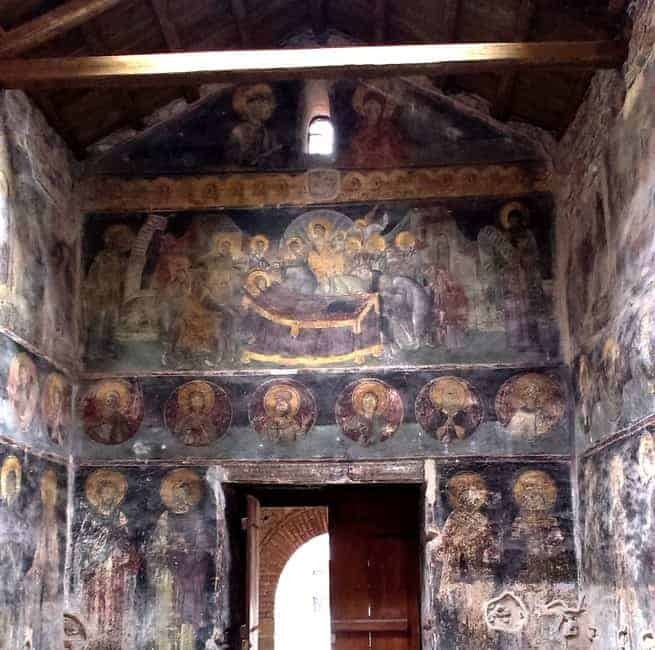 Another painted chapel worth mentioning is located in the town of Veroia (Macedonia): it was sponsored in 1314-15 by a middle-ranking noble family who had the financial assets and the artistic taste to choose the “best painter” of the region. West wall in the Christos Church at Veroia in Macedonia (Northern Greece). 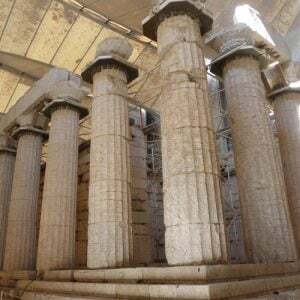 Why the Byzantines and especially their aristocrats erected or renovated religious (churches and monasteries) and charitable establishments in such numbers is a simple question answered by the sources and the foundation documents. It is a field you may be aware of from Western parallels and also a topic quite well illustrated by many scholars and authors. Indeed, philanthropy and sympathy for the poor were considered among the avenues to achieve the salvation of the soul during the Last Judgment, and thus often employed to assure the salvation of the empire and its ruler or its elites. “We present them (the poor and sick) to You (Christ) as intercessors for the forgiveness of our sins; through them, we beg for thy benevolence; through them, we beseech thy compassion”. In most cases, the founder or donor and his family, who participated in the foundation, donated money and provided pious distribution of alms to the poor in order to be buried and commemorated at the monastery. This also explains why all these religious establishments turned into mausoleums. Finally, patronage functioned as a very prominent act for the high aristocracy to display its prestige and identity, its social and cultural uniqueness and faith. 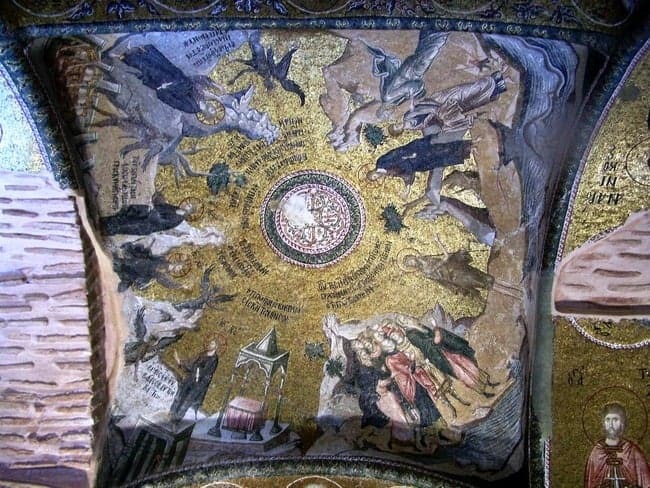 Gallery vault in the Chora Church (see below) with mosaic scenes from the Cycle of the Ministries and the Temptations of Christ. While in the Byzantine periphery, semi-autonomous appanages (despotates) and their byzantine lords (princes or despotes) attempted to expand and legitimise their control after continuous internecine civil wars and squabbles with the foreign principalities, Constantinople itself literally rose from its own ashes. The period of the Latin occupation had seen a series of disastrous events harming the urban character of the capital: fires, earthquakes and neglect caused heavy damages, whilst all contemporary Byzantine sources present a tragic picture of chaos and disrepair. Soon after 1261, the new emperor Michael VIII and his son Andronikos II (reign 1282-1328) repopulated the city with immigrants and made sure to commemorate their various renovation projects. 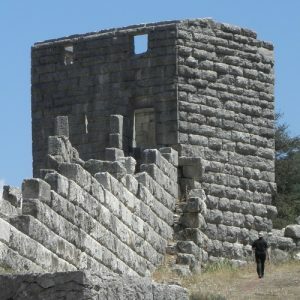 Part of the Great Palace, its counterpart at Blachernae and the Hippodrome were rebuilt, the city walls and the harbour were reinforced, and many new commercial buildings and public quarters were erected at the emperors’ initiative. Eventually, in the years 1261 to 1328 Constantinople was repaired to such an extent that the city’s former glory was revived. Hence, a great number of private palaces and houses as well as hospices, convents and ecclesiastical edifices were sponsored and rebuilt by members of the imperial family, the clergy, the nobility, wealthy merchants and statesmen; and of course by their spouses and widows, renowned female donors of noble or imperial blood. Exterior of the Chora Church. 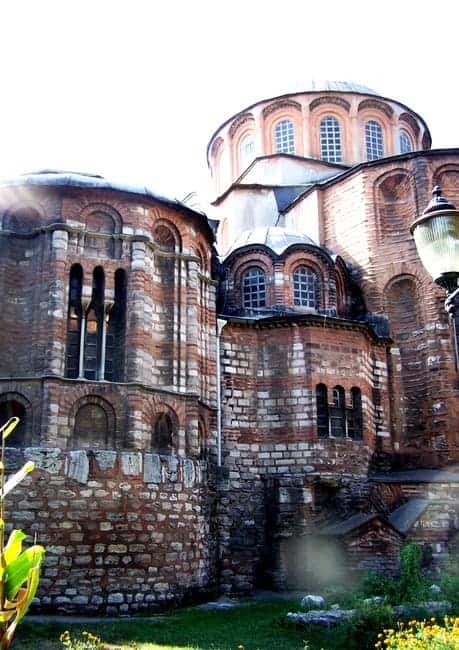 The Church of Christ in the Chora Monastery (or Kariye Camii) was and still is among the most famous monuments of Constantinople – or of Istanbul – since it has always been acclaimed for its rich mosaics and wall-paintings; today it is certainly a must-see monument. As the most famous and best-preserved decorated church of the Byzantine world, much ink has been spilt in analyzing its highly sophisticated iconography and style. 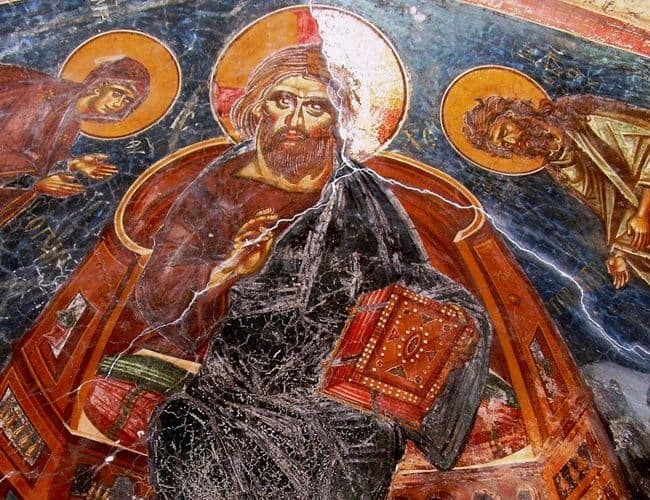 Although I am eager to present in detail the artistic matters and techniques and the iconographic significance that make Chora Monastery the Palaiologan monument par excellence, for the moment, I will focus my attention on its founder. The first edifice here, on the sixth hill of Constantinople, to the south of the Golden Horn, was founded by members of the imperial family of Alexios I Komnenos (founder of the Konmenian dynasty); namely by his mother-in-law around the end of the 11th century, and his son in ca 1120, after damages probably due to an earthquake. During the Palaiologan Era, a thorough remodelling of the monastery became the aim of its new and most prominent patron, Theodore Metochites (1270-1332). 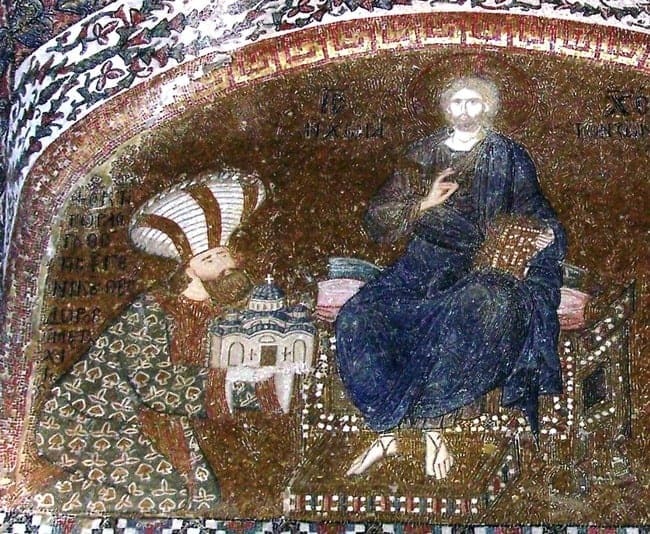 Mosaic in the esonarthex of the Chora: Metochites offering the church to Christ. Metochites was a highly educated nobleman and scholar who joined the imperial court, became personal adviser to the emperor and was soon entrusted with the important office of Megas Logothetes, head of all the Byzantine state departments, the highest office of the civil administration. He renovated the main church of the Chora Monastery from about 1316 to 1321 and commissioned the capital’s best workshops to decorate the church and the galleries with mosaics and his funerary chapel with wall-paintings. He had himself depicted above the Royal Door, dressed in a luxurious garment and sporting an imposing turban, kneeling in front of the enthroned Christ and offering the model of the church. Exonarthex of the Chora with Virgin and Christ and Isaac II (bottom left) as well as Maria Palaiologina (bottom right). Additionally, two further secular (and imperial) figures are depicted on the impressive large scale panel of Christ and Virgin, as a result of personal intervention by Metochites. Isaac Kommenos, son of Alexios I and the second refounder of the church, whose initial tomb was located in the church, is kneeling to the right of the Virgin. On the other side of the image, on Christ’s left, is depicted the famous Maria Palaiologina, the illegitimate daughter of Michael VIII Palaiologos, sister of Andronikos II and renowned sponsor of the Monastery before her death. Known as “Lady of the Mongols” or “Melane the nun”, Maria left the Christian world after her father’s geopolitical decision to marry her to the Mongol ruler, and returned to the capital only after the death of her husband. Thus, Methochites decided to commemorate these two prominent personalities not only due to their close association with the Chora foundation, but also because of their imperial ancestry and of course as witness to the Christian faith and the Empire. 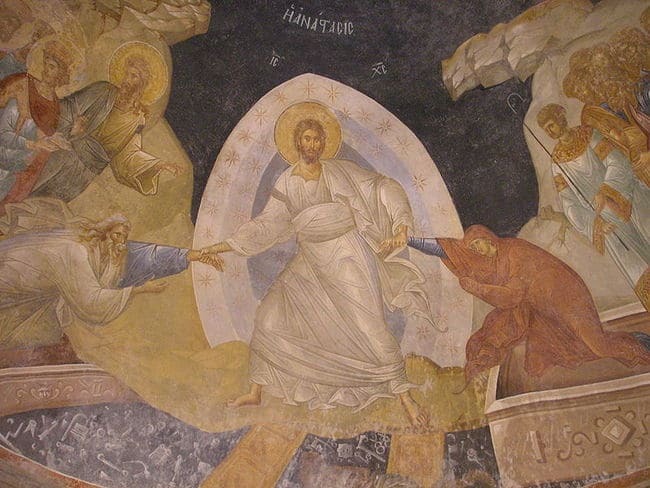 Resurrection scene in the Chora. Again, much more could be said and written about this “big man” and his work. In short, one thing is certain. A fourteenth-century aristocrat of great knowledge and education – closely familiar with the late antique world, philosophy, literature and the classical heritage along with the theological tradition – intervened and composed the most sophisticated church decoration of his era: an iconographic program that evokes in full splendour the fluid symbolic associations of the architecture and decoration, using the most lavish materials to create a “postmodern” aesthetic expression of Byzantine art. To borrow a phrase from Yeats, this “monument to” its patron’s “magnificence” became a symbol and “treasury” of the Capital during the last dawn of the Empire, just before it entered a new era of decay, civil wars and the rising Ottoman threat. 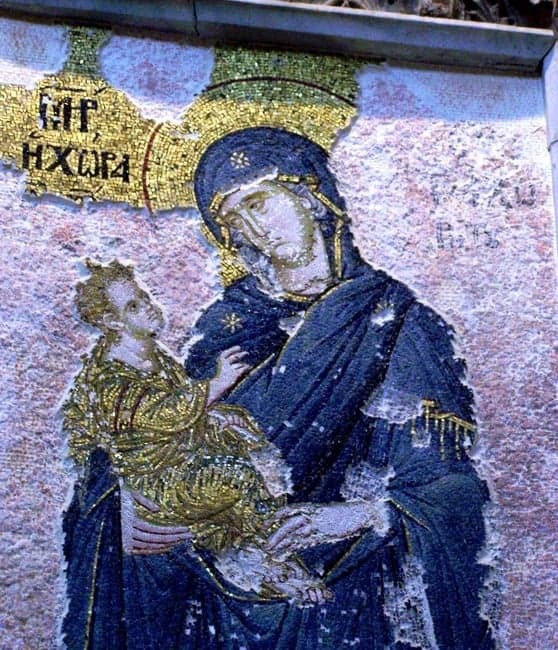 Virgin and Child inside the main church of the Chora. Chora Monastery as well as late Byzantium are complex and challenging topics, hard to do justice in a short text. Nevertheless, I will be back with further tales about the monuments of Constantinople and the first half of the 14th century, when the two Palaiologan emperors undertook to consolidate their ruling policy and restore the state and its heritage to its former greatness. There is a lot more to discover on a visit to Istanbul and there are more stories to be told about its glorious Byzantine and Ottoman past, its fascinating modern present and even its future. 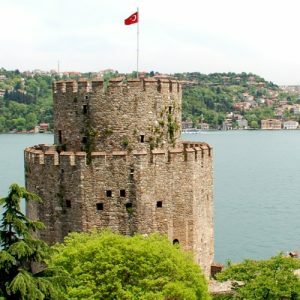 With Peter Sommer Travels you can fully discover beautiful and historic Istanbul on our Exploring Istanbul tour, and our while In the Footsteps of Alexander the Great: the Conquest of Asia Minor which offers a briefer introduction within a sweeping narrative that takes you through much of Western Turkey.